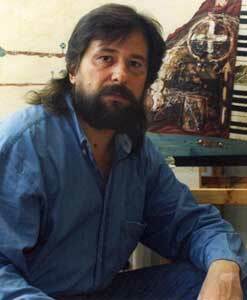 was born in April 26, 1957 in Ufa. Magnitogorsk, artist & graphic faculty. The member of Russian artists union. Participator of 100 exhibitions since 1985. Since 1996 he has been living and working in Moscow. Andrei Meier the First had come into Russia during Ekatherina had called for her countryman doctor to the new motherland to heal the eye of Svetleishiy i Tauricheskii. The result was reverse, but it hadn't followed any sanctions and otherwise, my ancestors had settled down into the russian nobility on state's service. They lived, studied, served, they were doctors and scientists, they were related to Garin-Michailovsky, they were acquainted with Aksakov. After all became I. Everything was against it. I've become Alexander. Difficult name Meier as a result of my parent's actions and counteractions has been changed to proud Buganin. I've choose dubious profession, of course, (an artist in scientists family-crank). Idiotic with to do all things countrarily lives and now. And thanks God!